All the work has been done, it’s Friday night … A small pub, packed with drunk people, the music is much too loud und nobody is thinking about – or even capable of – going home. Too fucked to go! I meet a friend at we have a beer or two, maybe ten!The night belongs to us – everybody knows this feeling, for some of us it’s been a while, some of us do it every night. 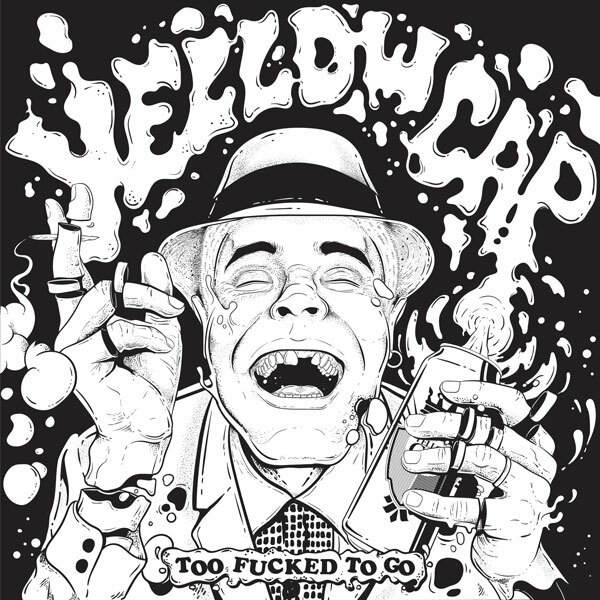 Remembering the beginnings of European ska in England, YELLOW CAP pay homage not only to the two tone scene of the late 70s but also to the working class attitude that these bands referred to. The sound is rougher, more to the core – you can tell that the instruments were recorded live and together as a band, not instrument by instrument, self-produced in the LBUM Studios in Berlin. The single will be released through the German ska label PORK PIE as a download. Thanks to the people at the AJZ Talschock in Chemnitz where the video was recorded. The TOO FUCKED TO GO cover has been designed by the extraordinary Brazilian artist “Shiron the Iron”, a friend of the band, who already was responsible for the last single’s cover and spent time with the band during this year’s Brazil tour. We´re so proud and happy! Stay tuned and skank on.